A little smile tugs at my mouth as I sit behind my desk at Beaufort Books/Spencer Hill Press. 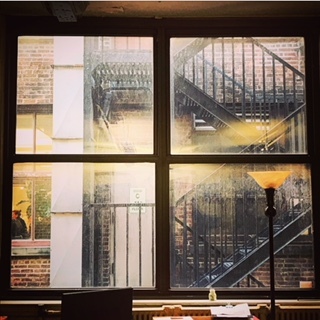 Looking out the window captures a scene that seems incredibly fitting for a book publisher in New York City: tall brick buildings hugged by winding fire escapes, windows that subtly showcase the busy lives of other office workers, and a cloudy blue sky. It’s exactly what I would picture when I think of a New York City book publisher. I know images can be deceiving. Although beginning an internship at a book publisher in New York City sounds intriguing, it’s not the first time I’ve done something that seems to fit the image. My college experience consisted of moving to Nashville to be part of the music scene. While it was lovely, I quickly learned that images aren’t always as they seem. Behind the Instagram filters and keywords that frame our stories are the real lives we live. The everyday, nitty-gritty details of life. While I enjoy going out and doing things that make a great story, I have learned that the real story is in the in-between, the ways I fill my day. The decision to grab coffee on my way to work. The smile at the security guard on the way in. The small talk with people in the elevator or the subway. The laughter with my roommates as we make dinner. Moving to different cities is interesting, and it makes you aware of things you can’t catch as easily on a vacation. My first week in New York City, I acted like a tourist, capturing those well-known tourist sites and posting them on Instagram. As I settle in, however, I’m noticing more of the nuances, and whether in New York, Nashville, or anywhere, these nuances, the stuff of life, are often the same. Everyone is dreaming, working, hurting, hoping. In the nuances, I am reminded that each of us is living a story, both unique to ourselves and similar enough to others’ to be part of the larger collective human story. I’m excited to be interning at Beaufort/Spencer Hill mostly to watch how stories are built and delivered. It’s a courageous act when an author decides to tell a story, whether fictional or personal or historical. The world gains a voice that we’ve been waiting to hear when an author writes. To learn the business of putting together a story and publishing it–both the exciting aspects and the little nuances–is a process that intrigues me, and even in the first few weeks of my internship I’ve learned a lot. Although the best parts of the story are in the details and everyday occurrences, I will admit: sometimes, the images are nice. I like the fact that I get to learn with a publisher in New York City, sitting at a desk by this window.